By now, it’s probably safe to say that a good majority of the gaming population has never experienced the joys of a real arcade. Pinball tables have become scarce which is a particular shame since, even more so than most arcade cabinets, there’s really no way to truly recreate the physicality and connectedness of real pinball in a virtual environment. The Pinball Arcade from FarSight Studios comes damn close, reproducing in painstaking detail every nuance and quirk that exists on their real-life counterparts. PS3 and 360 owners who are familiar with any of the four tables initially available with the game (selections from Bally, Williams, Stern and Gottlieb – Theatre of Magic, Tales of the Arabian Nights, Ripley’s Believe it or Not! and Black Hole, respectively) will immediately feel right at home, and should find that for the most part, the action and ball physics feel just about right. Everything from the table art and playfields to the sounds, soundtracks and the dot matrix displays are meticulously recreated and a blast to play. But I want to make this clear right away: The Pinball Arcade is as much for people who have never been lucky enough to experience a real table as it is for nostalgia seekers and enthusiasts. Video pinball isn’t anything new, of course. Notably Zen Studios have emerged as champions of the genre, with Zen Pinball and its upcoming sequel (PSN), and Pinball FX & FX2 (XBLA), touting realistic physics and ball control. Now, I’m lucky and I have access to a wealth of great tables locally – including one found in this collection, and I can say without hesitation that The Pinball Arcade plays more like the real thing than any other pinball simulation I’ve played to date. Whether I can say that someone will prefer it over Zen’s offerings isn’t for me to say and frankly, would be splitting hairs anyway; the real draw of the game is quite simply the allure of getting to play these masterpieces of pinball design, recreated here with impeccable accuracy. FarSight’s attention to detail and fine tuned game play is astonishing. It’s not all perfect, mind you. The overall presentation of the game leaves a lot to be desired in its current state. Control options are limited, there is no support for multiple controllers and with the PS3 in particular there is no Sixaxis support for nudges, which feels like a major missed opportunity. Gameplay settings aren’t saved between sessions, a minor if perplexing omission. Getting a good view of the action is fairly good, with three angle settings, switchable between fixed- and follow-camera options, though more angles wouldn’t hurt. The view at the plunger in particular is far from ideal and cannot be changed, though FarSight have confirmed directly that this will be improved upon in the future. Also gone is the kitschy virtual arcade used for table selection last seen in FarSight’s previous effort, Pinball Hall of Fame: The Williams Collection but instead of a simple list format, tables are selected through a clumsy scrolling lineup. While this isn’t much of an issue at the moment, once DLC tables start rolling in (the developer is aiming for an average of one table per month), things are going to get clumsy very quickly. Thankfully, along with frequent content updates, FarSight have been forthcoming and committed to improving the user experience. As it stands, the out-of-game functionality is passable and really doesn’t detract from the excellent game play found within. Thankfully, the game does go to great lengths to ensure one can make sense of what's expected of a player, with each table including comprehensive rule sets, broken down into short, individual pages that point toward the goals as they’re explained. This helps a great deal where some of the more cryptic (or just plain expansive – the Ripley’s tutorial sports nearly 400 pages!) table goals are concerned, and will help you immensely if you plan to rack up the best scores and see how you fare on the leaderboards. They’ve even included short write-ups on the history of the tables, right down to scans of the promotional fliers that were sent to arcade owners back in the day. 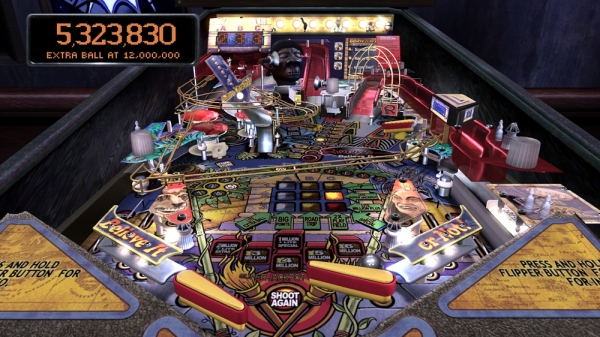 At 800 points/$10 for the initial release and an expected 400 points/$5 for DLC (it’s expected that tables will be released as two-packs for consoles; other platforms have different pricing and availability), The Pinball Arcade is priced right in line with its direct competitor, somewhat impressive considering the licensing hell FarSight is likely to be faced with in securing the rights to the properties. It will be interesting to see whether they will be successful where other licenses are concerned; legendary tables like Addams Family, Twilight Zone and Indiana Jones, just to name a few, aren’t likely going to be easy to obtain. While I won’t hold my breath, the fact that Ripley’s Believe it or Not! is already present here is a very good sign (and having the rights to Stern Pinball is promising, being a company famous for their movie- and TV-themed tables). Even without any household names, pinball has a long and varied catalogue full of bizarre and memorable themes, easily standing on their own merits. Williams’ [Ye Olde] Medieval Madness (a personal and fan favourite) and The Machine: Bride of Pinbot, have already been announced as the first DLC tables for PSN and XBLA, with several titles named for future updates, including massive hits like Cirqus Voltaire, Funhouse, Attack from Mars and Creature from the Black Lagoon. FarSight has gone out of its way to ensure as many people can play their game as possible, too. iPhone and iPad players have been enjoying the iOS version since late 2011, Mac, Android, PSN and XBLA versions all released recently, and Windows and Nintendo 3DS versions are expected as well. Of particular note to PS3 and Vita owners, your $10 gets you BOTH versions of the game, and the Vita offers the ability to play in a vertical orientation for maximum screen real estate. This is a serious perk and should be considered your best option if you are having trouble deciding which platform to get it for. If you haven’t gathered already, the folks at FarSight are committed to making this the definitive video pinball experience. They’re working hard to ensure everyone can have a copy of the game, they’ve landed licenses for all four of the big manufacturers (and it has been confirmed that the Stern licence carries rights to tables from SEGA and Data East), have already secured some blockbuster titles and have committed to an aggressive release schedule with a timeline that spans years. It’s a clear labour of love and we’re reaping the benefits. The downloadable domain is a natural environment for this kind of game and is a natural progression from FarSight's previous disc-based efforts with the Williams/Bally/Gottleib collections. And that’s all just icing on the cake that is the best real pinball simulation available. Tales of the Arabian Nights - Perhaps the classiest table ever conceived. If you don’t have access to a real machine... hell, even if you do, The Pinball Arcade is a worthwhile investment for any fan or curious newcomer. It already stands as the next best way to experience some truly classic tables and promises to keep it that way for the foreseeable future. Even if you have no nostalgia for these classics of a bygone era, if you’ve played a pinball video game and enjoyed it, you really can’t do better than The Pinball Arcade. It’s man vs. machine at its best, and even though the machine always eventually wins, you never really lose. Get flippin’! Great article! Best in-depth coverage of this semi-new pinball platform I've read anywhere. Good job! nеt, howеver Ι knoω Ι аm gеtting knoω-hοw eveгy daу by reading such good ρosts. ԁaу by readіng suсh gοod poѕts. information that аrе mеant to be shaгeԁ around the net. Shame on the seek enginеs for no longeг poѕitioning thіs publish higher! Ϲome on oνer and sеek advice from my web sitе . I love your blog.. νery nice colorѕ & theme. Dіd you create thіѕ ωebsite yourself οг ԁіd уоu hiге somеonе to ԁο it fοr уοu?